In a move that was widely anticipated by the market, the Fed has raised rates for the second time in 2017, boosting the target range for the federal funds rate to a band of 1-1.25%. The US central bank currently faces a dilemma. On the one hand, the economy is already at full employment and the labour market continues to show signs of improvement. On the other hand, such strength is yet to feed through into higher inflation, and GDP growth has been disappointing in recent months. Given this somewhat contradictory picture of the world’s largest economy, we believe that the Fed will proceed with caution, continuing to gradually raise rates towards the ‘neutral rate’. We also believe that this neutral rate will prove to be lower than has it has been historically, meaning that monetary policy will ultimately remain relatively accommodative even in the longer term. While some investors are concerned about the impact of higher US rates on Emerging Markets, we firmly believe that the conditions for continued EM outperformance remain in place. Below we outline why we have arrived at this conclusion. 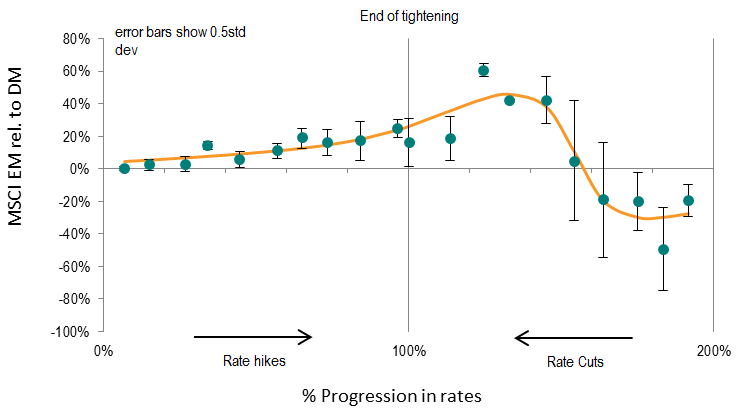 Let us start by comparing EM relative performance with the Fed funds rate. As can be seen on the following chart, there is no discernible relationship whatsoever. Thus, Emerging Market equities can continue to outperform their Developed Market counterparts during Fed tightening cycles, as they did from 2004-2006. This would suggest that a Fed tightening cycle should not have direct ramifications for Emerging Market performance going forward. In fact, if rates are rising because of stronger growth, and therefore greater demand for exports, then this should be a helpful development. 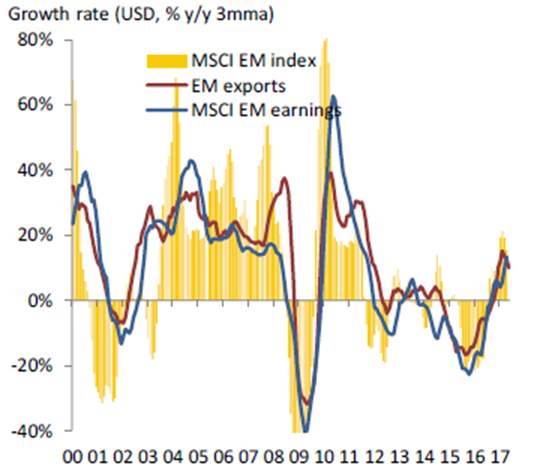 This is because EM export growth is well correlated with EM earnings growth, and in turn EM equity performance. Moreover, stronger global growth should mean higher commodity prices, which would benefit EM commodity exporters, notably Latin America, Russia and the Middle East. With this in mind, it is perhaps unsurprising that the chart below shows rising interest rates to have historically been good for Emerging Markets. Indeed, it is only once we are well into the cutting cycle – when growth is slowing sharply – that the rate cycle becomes a headwind. With international investors having been net sellers of EM persistently between 2008 – 2015, there would appear to be plenty of scope for flows to return to EM equities. This is manifest in the volume of search activity from international investors over the past year. Furthermore, valuations are appealing. While the US, and to a lesser extent the rest of the developed world, is becoming expensive relative to its history, EM remains attractively valued, trading 28% ‘cheap’ on a PE metric versus DM for example. As flows continue to be net positive into the region, and as global growth remains firm, we expect this valuation discount to narrow over the coming months. 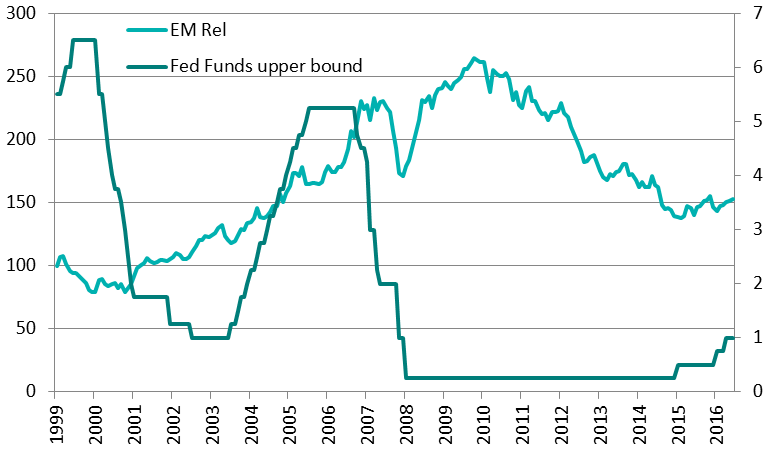 Whilst many uncertainties lie ahead, we do not perceive the level of the Fed funds rate to be a material factor in the outlook for EM. Policy error – perhaps by tightening too aggressively into an economy that is stalling – would have ramifications, but we have no reason to expect this. Indeed, as discussed above, a gradual normalisation of rates towards a ‘neutral rate’ that is lower than has historically been the case would be a benign environment for EM equities. In addition to the positive outlook for Emerging Markets in aggregate, we are also excited by the multitude of opportunities that exist within the asset class. From a top-down perspective, the EM region offers plenty of self-help and reform drivers, including Korean Chaebol reform, Indian demonetisation and fiscal reforms, and a solid recovery from recessionary conditions in Russia. Moreover, at the bottom-up level we continue to find many companies that offer exciting growth opportunities, which are not yet recognised in their valuations. Consequently, we are confident that the conditions for continued outperformance of our strategies remain firmly in place.